Our development team has taken all its front-end application development experience to give you the confidence that the functionality and experience will remain identical regardless of which deployment model you prefer or what mobile devices your users will use. You only need to focus on the business value – the rest is just choosing a deployment model. Diaphane is a responsive web application, which means that you get the exact same functionality and ease of use on a smartphone, tablet or computer. Good user experience on mobile devices is crucial, as it drives adoption numbers nowadays. Having a consistent experience across a range of devices will pay off with more users using the application, submitting the data you require faster. 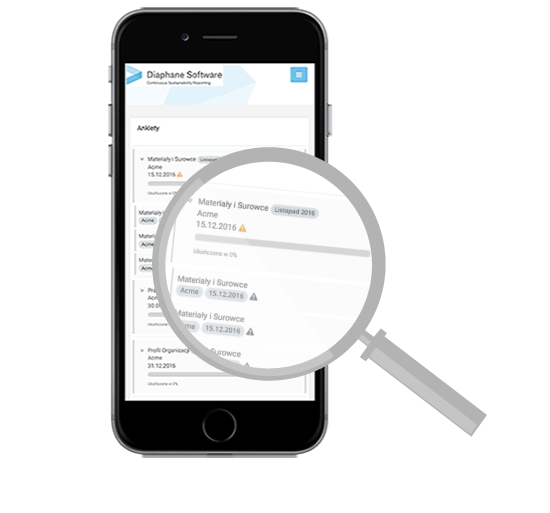 Diaphane is available in the cloud by default. It takes minutes for you to obtain access to your instance in the cloud after applying for a subscription. Your instance is secure, separated from other instances, and only you can have access to your data. The data will always remain your property, so if you decide not to renew the subscription for any reason, you will get all your data back. Cloud is convenient and flexible, but some companies still prefer on-premise versions. If you need such a solution, we have it covered – you can have an identical application installed in your data center. In case you decide to migrate to the cloud in the future, you will only need to export your historical data from the on-premise system and import into your cloud instance. The two models differ in how the access to new versions of Diaphane and reporting standards are managed. In the cloud option, new versions are available to all users as soon as they are released. In the on-premise system, you have the right to use new version as soon as it is released, but it will require installation by Diaphane Professional Services. This is why we encourage all clients to consider the cloud version in the first place.